Electric knives are normally good for small fish, bread and meat. They say that the preparation of the food has been just as much a part of enjoying the food as eating it. If you like your food well prepared or prepared in a certain way, then an electric fillet knife is for you. After a long day of hunting or fishing or after return from a job, you might want to make the perfect meat for you and your family. So, how to find the best electric fillet knife of 2019? 2 Why you need an electric fillet knife? 3 What makes a good electric fillet knife? Why you need an electric fillet knife? One way to do this is by having a meat or fish fillet. We don’t need to tell you how delicious that thing is. Filleting isn’t easy as it requires skills to precisely separate the meat from the bone. Apart from skill, the right equipment is required to ensure that the meat/fish gets sliced right. Fillet knives have grown in popularity because of their pennant of making the whole process easier. Let’s take a further look into this amazing product. What makes a good electric fillet knife? There are two choices when it comes to the material of the blade. You can either choose stainless steel or high carbon steel. Stainless steel is the industry standard as its resistance to corrosion and all round good quality. High carbon steel isn’t bad either as it’s usually infused with a resistive alloy. The different sizes of the blade determine the flexibility as well as the fish that you can fillet. You need to ensure that you get the right size that will allow you to fillet a variety of fish. Many people have coined this size to be 7.5 inches. The handle is just as important as the blade. This is the part that you’ll be holding during the entire process, so you need to ensure that it has a good grip and is comfortable on your hands as well. The options are normally plastic, wood and rubber. The best one of these is normally for you to decide. The only thing to note is that wood might need a bit more maintenance as its more likely to rot when left in water for too long. There is a case to be made decision on which fillet knife should be used on meat/fish. There are electric knives and manual knives. The choice is mostly upon you the user, but let’s dig deeper into these two types of knives. There is the electric Fillet Knife that uses electricity or it can be battery powered. These knives speed up the fillet process significantly and can work well on larger fish. The knives are also versatile in their use. On the other hand, there are manual knives that are controlled by the user. These knives aren’t fast as electric knives, but offer greater precision than them. This is because they are controlled by the user. Some might argue that manual knives offer less wasting of meat because the user has more control and only needs to master proper technique. All we can say is you the user have the ultimate choice. The advantage of being able to fillet faster is definitely hard to pass down considering how tedious filleting is. Many people tend to prepare the catch where they are. This is understandable considering how perishable the catch usually is. It’s because of this that you should consider power availability wherever you might be carrying this knife. The last thing you want is to have a knife is useless once you caught your food. The best option would be to opt for the battery powered knives whenever outdoors. This mostly applies to those that go fishing. It’s important to understand the risks, especially if you’re going to use your electric knife. The surroundings are normally wet and electricity and water don’t mix well. Be aware of your surroundings and make sure that you operate your equipment in a safe environment. There are normally two choices when it comes to best electric filet knives. You could choose the battery powered ones or the electric powered ones. The choice of which one you’re going to use will be determined by the size of the fish and the number of fish. If the fish is big or there are any of them, the electric powered one will work best. If the fish is small or there are a few of them, then the battery powered one will fare well. Depending on the activity that you might be doing, you’ll have to think about the size of the knife. The battery powered ones tend to be heavier since they have a battery inside of them. If you are going to be using it for hours, then use an electric powered one if possible. As the former might be tiresome to use. This type knife offers a number of benefits, but the biggest one is faster filleting of the meat. On top of that, it also makes the process of separating the meat from the bone easier. This ensures that you get more meat for your meal and that less of it is wasted. On that note, let’s look at what we consider to be the best electric fillet knives in the market. After spending lots of time on research; We have selected top 5 electric fillet knives. This knife kicks off our list and it’s an awesome knife to have as it offers double the speed and more power than the standard electric fillet knife. This is no surprise considering it needs 110volt power and has a heavy duty motor. The blade is 7 ½ inches of reciprocating style blades. It’s also dishwasher safe. The strength of this knife makes it easy to cut through the ribs and backbones. It makes the filleting process easier due to its power. It doesn’t come with a bag to cover the blade when not in use. Here’s the next knife on our list. It’s from the reputable Mister Twister brand. The knife comes in Green or Yellow color. 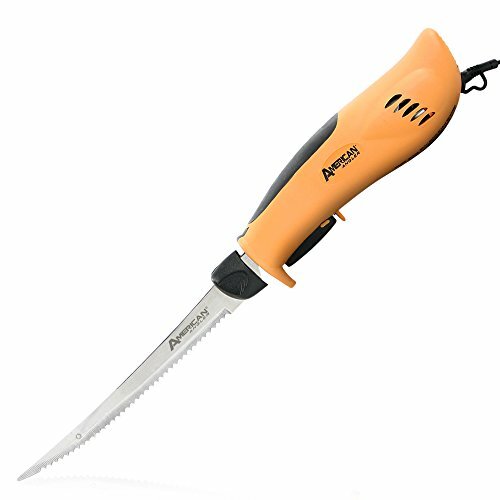 The Knife has more power than the previous one on this list as it features 120V AC. This combines with the Mister Twister action that consists of heavy duty gears and bearings ensures that you can cut through your meat with ease. 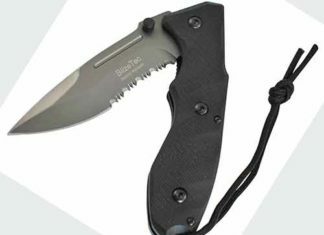 The product also features a blade release as well as a safety lock. The safety lock ensures that the machine doesn’t accidentally turn on and cause harm or damage. The handle design is also commendable as it provides a firm but yet relaxing grip. It’s durable and long lasting. This is the first battery powered the knife on this list. Even though its battery powered, it does match its own with the other electric powered knives. The lithium ion battery will give the user 80 straight minutes of use without loss of power. The knife is also consistent with the torque it provides no matter the battery power or meat being filleted. The product also offers faster charge time for the user to ensure that they can use the knife whenever needed. The charge lasts for a good amount of time. The knife is pretty powerful despite being battery powered. For a batter powered knife, it’s light. There is a design flaw for some of the knives as the blades can’t be released. This is by far the best electric fillet knife we have ever had and it’s the best on this list. To start off, the knife has a gear and motor that are powerful enough to provide two times the torque of the standard electric filet knife. The 110V motor on this knife ensures that your fillet turns out great as it maintains smoothness and consistency throughout the process. The design of the knife ensured that we could use it for a long time without experiencing much fatigue. Finally, it comes with a glove, 5 blades and a carry bag as well. It offers more variety thanks to the different blades it comes with. The bag given out with the knife doesn’t fit the long blades. This Chard knife is definitely one to consider as it comes with an extra- long cord as it’s about 8 meters long. The blade is at 7 inches long and is made of stainless steel to ensure the quality and durability of the knife. The110V motor combined with the blade ensures that you experience quick and easy filleting. The blade can also be easily removed for sharpening as well as cleaning purposes. There are some known issues with the blade attachment mechanism. These to us are the best electric fillet knives currently in the market. If you’re a beginner, it’s best to understand that some of these knives might be too powerful for you to handle. To ensure that you don’t waste fish or meat, take it slow and don’t rush through the filleting process. It will reduce your lots of pain if you able to select the best electric fillet knife. 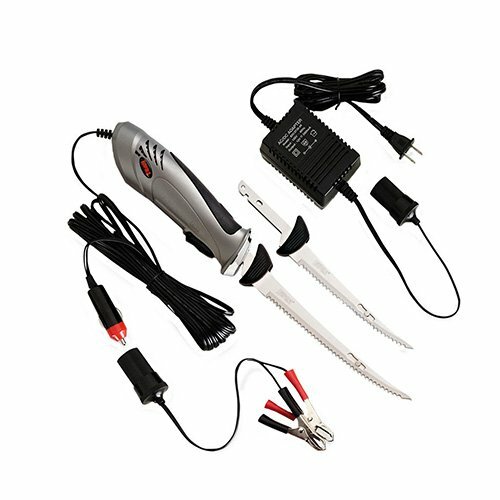 Being a professional fisherman, I want to share with you some of the best electric fillet knives that I’ve come across. Fishing is fun but very challenging at the same time. If you fish big like me, then you need to have one of the best electric fillet knives to fillet fish quickly and clean easily. High-quality electric fillet knives can perform the work of a traditional fillet knife but a little bit quicker and better. Fillet knives normally use electricity to fillet fish or slice meat. Also, they are very durable, ergonomically designed, and sharp. They can be used to slice through a pile of fish much quicker when compared to a normal fillet knife. Question: What are the benefits of using an electric fillet knife over the traditional knife? Answer: First of all, an electric fillet knife does the job in half the time of a traditional fillet knife. 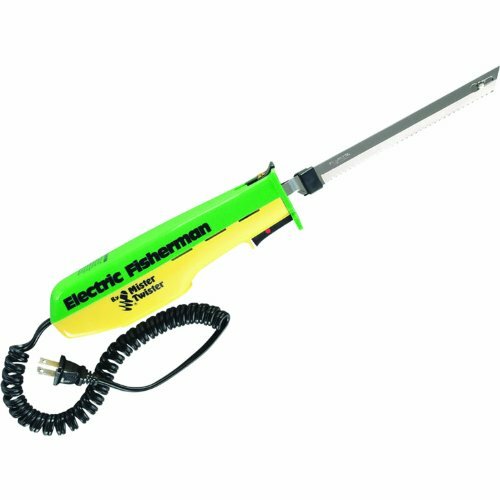 Secondly, an electric fillet knife requires little strength as it is powered by electricity. Also, these knives come with multiple blades that enable you to use them appropriately. Electric fillet knives are easy to control especially when cutting large meat or fish. In addition, these knives are made of stainless steel blades which don’t corrode easily and will last longer. Question: Features to look for in the best electric fillet knives? Answer: If you want to land the best electric fillet knife, you will have to look at these features: type of blade the knife is made of – stainless steel is the best, the type of handle – it should be ergonomic, sturdy, and comfortable, blade length – it should be between 7-inches to 9-inches, checks it power, and safety features such as safety lock mechanism and blade lock system. Also, you’ve to choose between a corded and cordless knife. A cordless knife is very convenient. Question: Can I use my electric fillet knife to cut roasted beef or turkey? Answer: Of course, you can. A quality electric fillet knife should be able to cut through different types of meat and fish. Choose a fillet knife made of stainless steel and it should have a lot of power. That’s why you should consider choosing one with 110 volts or more. Question: How many extra blades do electric knives come with? Answer: This varies from one brand to another. But most knives come with at least 4 blades, which allow you to change them according to use. There are those that are suitable for slicing small fish and others are ideal for big fish or meat. The more the blades, the better and more versatile the knife will be. How does the Bubba Blade electric filet knife compare? For the electric knife, I don’t prefer Bubba.